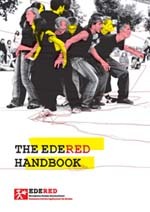 This is the WebSite of EDERED, organisation which are promoting intercultural work through drama and theatre with children and youth in Europe. from 31 July to 11 August 2019 Course Center Högsand, Hanko, Finland. The theme of the Encounter will be “IT’S MY NATURE“. Finland will host next EDERED in 2019. Eleven countries from all around Europe are invited to participate and develop the Theme “IT’S MY NATURE”. Participants aged 15-17 and their workshop leaders are going to work together covering topics of Environmentalism and Nature’s role in everyday life. Let’s take care of our Nature! We really need our Seas, Forrests, Mountains, Animals and everything from Mother Earth. Let’s take care of ourselves as well. It’s My Nature, it’s Your Nature! Participating countries will be Belgium, Croatia, Denmark, Estonia, France, Israel, Poland, Switzerland, Sweden, Turkey and UK. 2018, Toulouse, France, "Great Explorers"
2002 – Budapest, Hungary, "Changes"